What if two or more people want to edit the same file at the same time? And how do you enforce the rule? But what happens if Ginny commits another set of changes while Hermione is resolving? And then Harry commits yet another set? 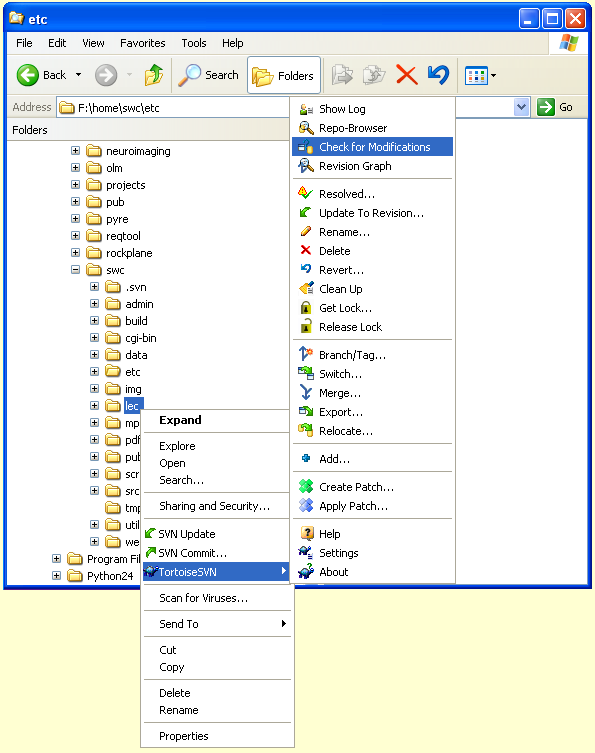 svn commit Send changes from working copy to repository (inverse of update). svn commit -m "Comment on the changes"
Follow the instructions given to you by your instructor to check out a copy of the Subversion repository you'll be using in this course. Unless otherwise noted, the exercises below assume that you have done this, and that your working copy is in a directory called course. 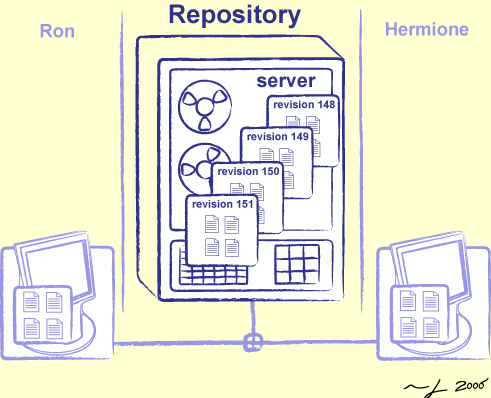 You will submit all of your exercises in this course by checking files into your repository. Create a file course/ex01/bio.txt (where course is the root of your working copy of your Subversion repository), and write a short biography of yourself (100 words or so) of the kind used in academic journals, conference proceedings, etc. 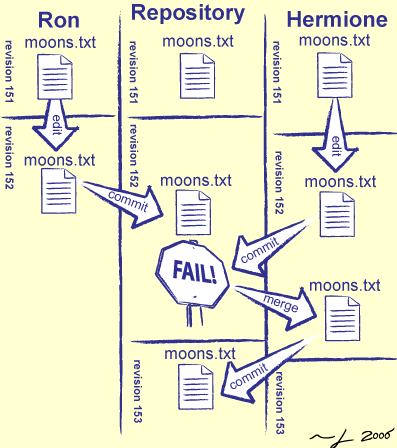 Commit this file to your repository. Remember to provide a meaningful comment when committing the file! What's the difference between mv and svn mv? Put the answer in a file called course/ex01/mv.txt and commit your changes. Once you have committed your changes, type svn log in your course directory. If you didn't know what you'd just done, would you be able to figure it out from the log messages? If not, why not? In this exercise, you'll simulate the actions of two people editing a single file. 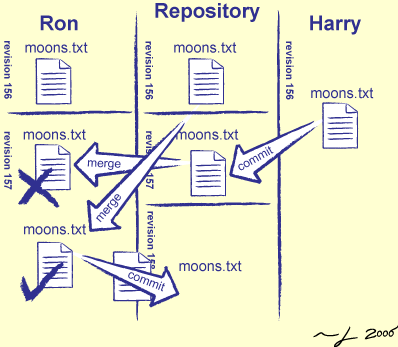 To do that, you'll need to check out a second copy of your repository. One way to do this is to use a separate computer (e.g., your laptop, your home computer, or a machine in the lab). 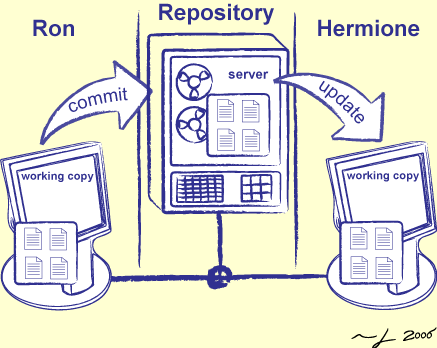 Another is to make a temporary directory, and check out a second copy of your repository there. Please make sure that the second copy isn't inside the first, or vice versa—Subversion will become very confused. d) Edit Green/ex01/planets.txt so that its contents are as shown below. Do not do svn update before editing this file, as that will spoil the exercise. 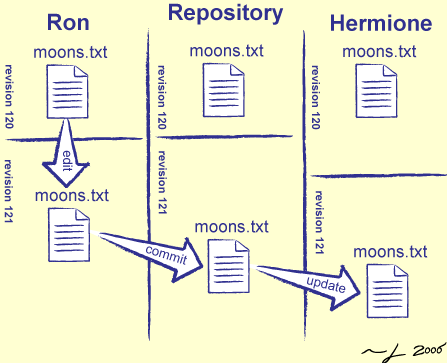 f) Update the Blue repository, and check that planets.txt now has the same content as it has in the Green repository. Add another line or two to course/ex01/bio.txt and commit those changes. 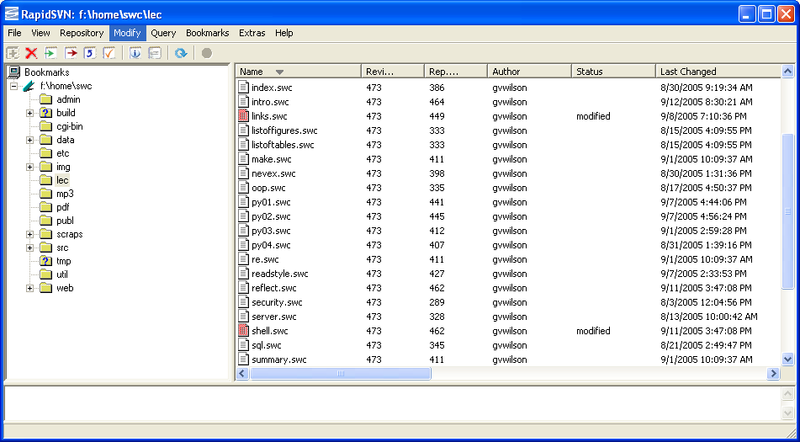 Then, use svn merge to restore the original contents of your biography (course/ex01/bio.txt), and commit the result. When you are done, bio.txt should look the way it did at the end of the first part of the previous exercise.) Note: the purpose of this exercise is to teach you how to go back in time to get old versions of files—while it would be simpler in this case just to edit bio.txt, you can't (reliably) do that when you've made larger changes, to multiple files, over a longer period of time. Subversion allows users to set properties on files and directories using svn propset, and to inspect their values using svn propget. Describe three properties you might want to change on a file or directory, and how you might use them in your current project.